As Cheryl K. Chumley writes, “Robyn Urman, a rescuer with the New Jersey group, Pet ResQ Inc, said this isn’t the first time Muslim Brotherhood members had been busted trying to use animals as gasoline-fired bombs, Breitbart reported. And this particular discovery didn’t end well for all the dogs.” The report goes on to state that Muslim Brotherhood members were actually caught dousing 20 puppies with gasoline but only three of them could be saved. Similar reports are also being made by other media organizations including TIME, CBS, and Israel National News. Some organizations, however, are more skeptical and attempt to cast doubt upon the veracity of the claims. For instance, Foreign Policy states that the only documentation available to confirm the story involves a Facebook message to the New Jersey animal rescue operation from an Egyptian activist relating the events. Not only would weaponizing puppies be wildly impractical, there is no documented evidence of this occurring -- nor has the Brotherhood been able to stage protests in Tahrir Square since Morsy was toppled this summer. The rescue worker who relayed the story, when contacted by Galey, said that she did nothing to verify the allegation. Of course, while the veracity of the rescue organization’s claim may be rightly questioned, the veracity of Foreign Policy’s claims should be questioned as well. As the official news organization of the Council on Foreign Relations, a globalist war-mongering endeavor, Foreign Policy obviously has an agenda which neither takes the best interest of the American or Egyptian people to heart. 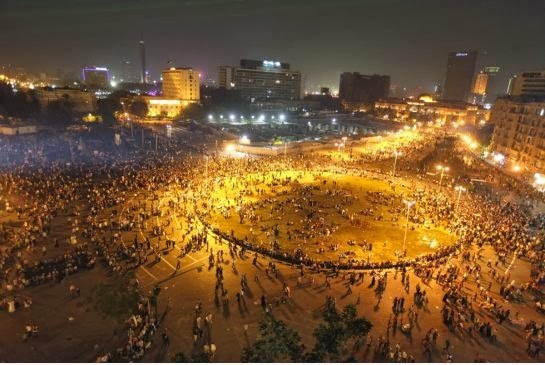 Indeed, suggestions that the Brotherhood has been unable to stage demonstrations in Cairo are patently false since that is precisely what the Brotherhood has done ever since Morsi was ousted. Regardless of the veracity of this particular story, it is true that the Muslim Brotherhood is nothing more than a tool of Western intelligence acting as a force of destabilization in Egypt. This is a fact that is largely recognized, albeit unconsciously, by the Egyptian people after having been exposed to the Muslim Brotherhood’s methods of rule during Morsi’s brief reign. Indeed, as stated earlier, It is important to remember that the Muslim Brotherhood protesters in Egypt have themselves been caught in numerous violent acts, such as firing weapons at Egyptian police, even throwing political opponents off rooftops, and firing rocket-propelled grenades at a state satellite facility. The Brotherhood detonated a car bomb outside of a building which housed some Egyptian intelligence officers in Ismailia. This is in addition the targeting of Christian churches for destruction, regardless of the fact that these churches, nor those who worship in them, had anything to do with the perceived wrongs done to the Muslim Brotherhood. Clearly, this is fanaticism in all its glory. With that in mind, any talk of supporting democracy and the will of the Egyptian people by the Muslim Brotherhood, Western governments, or mainstream media outlets should be dismissed out of hand as the Brotherhood clearly does not have the support of the Egyptian people. If these sources truly value “democracy” and respect of the will of the people, then the fact that the overwhelming majority of Egyptians have spoken against the Muslim Brotherhood should end the debate.